This is one the strangest, yet provactive and progressive albums I have ever heard. I have been spellbound by this album ever since I heard it. I know that bands always say that their music is "impossible to define", so much so that the term has last much of it's meaning. However, in the case of La Masquerade Infernale, the term is more applicable than it has ever been to any album, at any time, anywhere. The music is sweeping, complex, and orchestral and navigates the heights of Dionysian ecstasy. 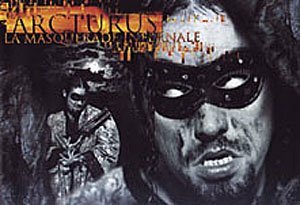 Arcturus employs a wide variety of instruments and vocal styles in creating an incomprehensible, yet blindingly brilliant cacophony of sound. The two vocalists play off each other in an almost operatic style, rarely repeating a melody, yet somehow embedding every lyric in the depths of the mind. The instrumentation is dramatic and unpredictable, moving from black metal to evil carnival music to progressive rock within a few minutes. Many of the vocal and instrumental interplay employs exotic, seemingly eastern (Arabic? ), melodies and structure. It is almost an intellectual exercise to listen to and pick up on all the subtleties in the album. This album is probably not for everyone, but those who enjoy bands like ...In The Woods, Samael or even vintage Genesis stuff will be the most likely to pick up on it. Those who open their minds to this album are in for a big time sonic reward.